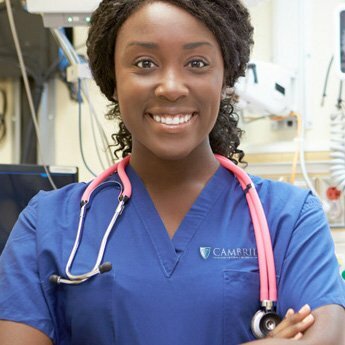 At Cambridge, we provide students with the training they need start their careers as professional Practical Nurses. Our students gain the skills and knowledge necessary to complete the National Council Licensure Examination (NCLEX-PN) and become a Licensed Practical Nurse (LPN). We provide more than just training to pass the exam. We give you everything you need to be a successful LPN at a healthcare facility. At Cambridge, you will receive training through clinical rotations, gaining valuable experience in medical facilities. In the classroom, you will get the personal attention you need to prepare for the licensing examination, as well as the work you will do as an LPN. Our commitment to academic success and clinical skill mean that you will complete the program ready to provide superior patient care. We have cutting-edge facilities in which you will learn how to use the technology and equipment used in the field. When you graduate, it is our goal to make sure you can hit the ground running, fully prepared to complete your work as a practical nurse. According to the U.S. Department of Labor, employment of LPNs is expected to grow much faster than average from 2014 to 2024. Employment is expected to increase 16% in that time, requiring an additional 117,300 employees to fill the needs of the healthcare industry. The job growth in this field is tied to the long-term care needs of an aging population, and the general increase in need for healthcare services. Many of the new positions for LPNs will be at facilities that provide services to the geriatric population, including nursing care facilities, community care facilities and home healthcare services. While these facilities will drive much of the growth in the industry, hospitals will maintain or even increase their demand for trained LPNs and remain a major employer in the industry. In addition to a healthy job market, work as a Licensed Practical Nurse is also a common first step to becoming a Registered Nurse (RN) or finding another role in the medical field. Practical nurses and licensed practical nurses (LPNs) are responsible for basic nursing care, medical care and the overall patient experience. Gathering and presenting information to RNs and physicians. LPNs often report to a registered nurse or doctor. As LPNs typically spend more time with patients than the RN or physician, they are responsible for communicating vital information about the care and condition of their charges. Evaluating the overall needs of the patient. Practical nurses often assess a patient’s needs beyond the medical, paying close attention to everything from physical comfort to potential psychological concerns. Educating patients. This education concerns not just the care they are receiving currently, but also future care needs. You will receive a Diploma in Practical Nursing upon successful completion of this program. Should you choose to sit for and pass the NCLEX-PN examination at the end of this program, you will then be able to seek work as an entry-level Licensed Practical Nurse (LPN).